Monday 8th November 1915: The recent Home Office order prohibiting external lighting in Bedfordshire between sunset and sunrise has come into effect in Leighton Buzzard and is being rigorously enforced. While the great majority of tradesmen have cheerfully complied with the instruction that no window may show more than a “dull subdued light” there have been difficulties with reflected light, where light bouncing off a mirror or polished metal has sent escaping beams into the street. Blind makers are extremely busy and struggling to meet the large number of orders they have received. While most people are very willing to cooperate with the order, many are still forgetting to close the shutters or draw the blinds before the gas is lit. So far a gentle reminder has been thought sufficient. Leighton Buzzard market is being closed at 6pm and evening services at All Saints Church have been moved to the afternoon as it is impossible to effectively screen the church windows. While Leighton has been plunged into darkness Linslade, being in a different county, is not subject to the same regulations. The anomaly has been partly dealt with by Linslade Urban District Council abolishing street lighting, however traders are still burning gas lights and motorists are still using their headlights. Linslade Council are believed to have applied for an Order which will bring their town in line with its neighbour. 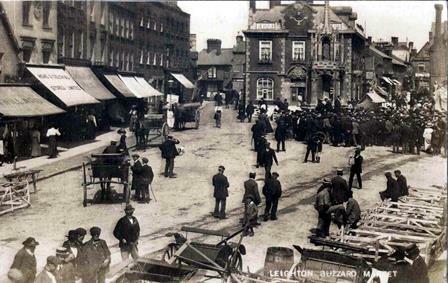 In the meantime Leighton’s inhabitants must hope that they will not be the victims of bad German marksmanship if a bomb aimed at Linslade misses and hits the darkened streets of Leighton Buzzard.